In 2016. In amidst the summer movie lineups of animated feature, disappointing flops, and blockbuster sequels, a surprising hit emerge in the form of comedy film titled Bad Moms. Directed by Scott Moore and Jon Lucas, the movie, which starred Mila Kunis, Kristen Bell, Kathryn Hahn, and Christina Applegate, followed the story of character of Amy Mitchell, an overworked and stressed out mom, that (along with her two mom friends) decide to quit being a mom and the duties and expectations that go along with that title. Filled with cameo appearances, raunchy humor, R-rated gags, and some moral lessons about being a mom (and raising a child), the movie itself received mixed reviews from critics and moviegoers, with some finding its premise to their liking, while others simply believed that the feature could’ve offered more than what was presented. Regardless, Bad Moms, while it didn’t break records at the box office, was able to rack in $180 million worldwide against its $20 million production budget; making its money back and then some. Now, a year later (2017), STX Entertainment, Huayi Brothers Pictures and directors Scott Moore and Jon Lucas present the follow-up sequel to Bad Moms, which is appropriately titled A Bad Moms Christmas. Does this newest “Bad Moms” installment find its humor (and holiday spirit) or is the movie falter within its Christmas-themed narrative? The holiday season has arrived and, with only a week until Christmas Day, Amy Mitchell (Mila Kunis) is stressing out of her family’s yuletide plans, overwhelmed by the motherly responsibilities during this joyous celebration. 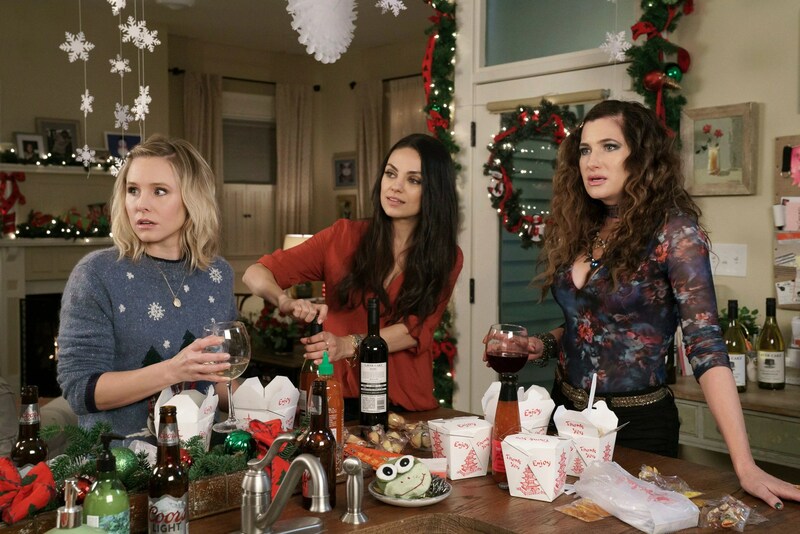 Amy is also joined by friends Carla (Kathryn Hahn) and Kiki (Kristen Bell), who also share their own motherhood anxiety about Christmas and trying to make their kid’s top priority and just trying to survive the overall craziness of the holidays. Adding more stress and further complicating Amy’s Christmas expectations is the arrival of her mother, Ruth (Christine Baranski), a stern judgmental woman who’s come to dominate the holiday with her own overzealous Christmas plans, belittling her daughter, with her husband, Hank (Peter Gallagher) dutifully supporting her overbearing desires. Similarly, Carla Dunkler gets an unexpected visitor from her estranged mother, Isis (Susan Sarandon) a carefree / wandering spirit who’s gambling addiction finds her showing up for Christmas in need of money, while Kiki gets a visit from her clingy mother, Sandy (Cheryl Hines), who’s committed to joining her daughter’s family for all hours of the day and night. As the countdown to Christmas inches ever closer, Amy, Carla, and Kiki face their own personal challenges of having their mothers over for the holidays as unresolved emotions within their mother-daughter relationships reach a tipping point. Personally, I liked the 2016 film Bad Moms. It was funny, humorous, and had a little heart to its R-rated raunchy-filled premise of when overworked / overstressed moms decide to “quit” being moms. Yes, it had some problems here and there, but it was still effective as a comedy movie that brought a lot of laughs to the proceedings, especially the raunchy kind. Additionally, the movie’s cast (Kunis, Bell, Hahn, and the rest of them) also provided to be another highlight of the feature; each one casted perfectly in their respective roles. To me, despite the film not generating a huge profit at the box office, Bad Moms (as well as the Christmas-themed comedy film Office Christmas Party) was one of the best comedy films of 2016. Given out much I liked the movie, I was secretly hoping that a sequel to Bad Moms would materialize sometime in the near future. Of course, it surprised me greatly when it was announced that Bad Moms was getting a Christmas-themed sequel and that it was being released the following year (i.e. 2017). After seeing the two trailers released for the movie, this follow-up feature film, which is appropriately titled A Bad Moms Christmas, was definitely something I was looking forward to seeing, especially when the three principal lead actresses would be returning as well as the narrative premise of their character’s moms playing a part in the story. So, what did I think of it? A Bad Moms Christmas, thanks to its cast, comedic timing, and fun premise, makes for an effective comedy sequel. It doesn’t surpass the original film, but it was a solid and entertaining second installment. Returning to their post (as directors) are Jon Lucas and Scott Moore, the two-previous duo who directed the first Bad Moms film. Given the fact that they already directed the previous movie, A Bad Moms Christmas hugely benefits from it, especially since both know the “lay of the land” and how to structure this comedy sequel. It also helps that Lucas and Moore also return to write the film’s script. Like before, the duo directors present a unique scenario for the trio of moms to navigate through (i.e. dealing with the stress Christmas season as well as their individual mothers coming to stay with them during the holidays as well as their bringing their own personal drama into the mix) and populating the feature with some crazy and playful shenanigans. Additionally, in amongst the comedy scenes, Lucas and Moore interject a few heartfelt scenes on mother / daughter drama (as seeing with each one of the Bad Mom’s trio). It’s not a huge difference from the commentary message that was presented in the first feature, but it works within the context of this comedy sequel. Also, the movie’s usage of the Christmas Holiday festivities is a fun premise to present with some creative yuletide scenes. While there’s been other 2017 comedy films that failed (Fist Fight, Snatched, Baywatch, and ChiPs), A Bad Moms Christmas does succeed in its jokes and gags department. Much like the first movie, the film does feature a lot of low-brow R-rated raunchy style humor. This means that the comedy aspects (as a whole) is nothing or original, but it’s how Lucas and Moore (as well as the film’s cast) presents the various jokes and gags throughout the film, which is usually the key to comedy movies (as well as sharp writing). So, like Bad Moms, be prepared for a lot raunchy / crude comedy jokes that quick and fast, with plenty of F-bombs, sexual innuendos, and other R-rated gags. Like I said, it really doesn’t reinvent the comedy wheel, but A Bad Moms Christmas delivers on the same style humorous jokes that were achieved in the first film (and that’s a good thing in my opinion. Lastly, in terms of filmmaking, the movie is shot and presented in a very well-mannered way within its respected film genre. Basically, what I’m saying is that A Bad Moms Christmas looks and feels like your good standard R-rated comedy movie, with addition of a lot of Christmas themed set layouts and decorations. For all positive reasons to like the movie, A Bad Moms Christmas does have a few negative points that makes the sequel fall short of surpassing the original film. Perhaps one of the main reason has to be the story does lack substance in a few areas. While the first movie wasn’t exactly fresh or original for a comedy feature, it still had enough material to work within its theatrical construct to create a wholesome (yet raunchy) comedic tale from start to finish. A Bad Moms Christmas continues that trend, but the movie does feel a bit slightly thinner in its presentation. What I mean is that the movie could’ve had more depth in certain areas and better focus on certain things (characters, events, situations, etc.). There’s also a bit of rehashing of certain things from the first one that this sequel that don’t quite measure up to (in the grand scheme of things in the movie), including a few parts that really don’t go anywhere and are simply there for R-rated comedy relief. Like a lot of sequels, it’s hard for a second installment to overtake the original as A Bad Moms Christmas simply can’t achieve that elevation. There is another area where the movie falters a bit, but I’ll go into more detail on that in the paragraphs below. One of the big highlights of the first Bad Moms movie was the three female leads that made up the film’s principal protagonist characters, finding the conflicted emotional breaking point in Mila Kunis’s Amy Mitchell, the wildness and carefree in Kathryn Hahn’s Carla, and the overworked and sheltered in Kristen Bell’s Kiki. Thankfully, with this movie being a sequel, A Bad Moms Christmas sees both the main characters return to the forefront of the narrative once again, with trio of actresses returning to their posts respectfully. Keeping in rhythm with the last movie, trio of the female lead characters play to their strengths and retain the essence of the character’s persona from the previous installment. Kunis, known for her roles in That 70’s Show, Jupiter Ascending, and Ted, continues to be the main focal point of this comedy, playing Amy with enough comedic bits as well as a touch of sincerity to her plights of being a mom and dealing with the added pressure of her mom taking control of her family’s Christmas merriment. Likewise, actress Kathryn Hahn, known for her roles in Parks and Recreation, Transparent, and We’re the Millers, provides a ton of laughs as Carle and acts as the “wild card” of the bunch with her sexual / foul-mouth comment and remarks, while actress Kristen Bell, known for her roles in Frozen, Forgetting Sarah Marshall, and Veronica Mars, continues to give her character of Kiki a quirky style of oddball sayings and troublesome woes with her clingy mother. Aside from the “Bad Moms” trio of the film’s lead actresses, one of the highlights of A Bad Moms Christmas is the inclusion of their mothers dropping in for the holidays and raining on their daughter’s Christmas festivities. 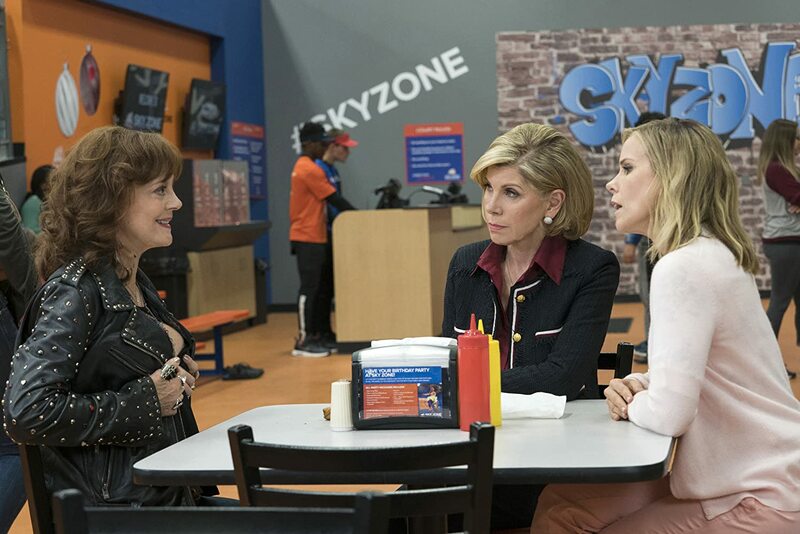 Of these three new character, the absolute best (hands down) has to be Ruth Mitchell, Amy’s opinionated and overzealous mother, who is played by actress Christine Baranski. Known for her roles in The Big Bang Theory, The Good Wife, and Into the Woods, Baranski is hysterical in the role of Ruth, with whatever comes out of her mouth in her dry humor delivery is fantastic. She’s a riot on-screen and definitely deserve a lot of credit for making A Bad Moms Christmas a fun sequel. Additionally, along with Kunis’s Amy, Baranski’s Ruth also carries a few dramatic / emotional moments of the feature, which do work, especially when her character has to admit something that she doesn’t want. All in all, Baranski is terrific as Ruth and one of the best character in the entire movie as I was laughing the most (and hardest) at her comedic bits. In the middle of the pact is the character of Sandy, Kiki’s super clingy mother, who is played by actress Cheryl Hines. Known for her roles in HBO’s Curb Your Enthusiasm, The Ugly Truth, and RV, Hines has fun time as the super close motherly character of Sandy, performing her with enough humorous zeal and weird comments / remarks that par well up against Bell’s character of Kiki. Hines does where Kiki gets her overall quirkiness from. The last one is the character of Isis Dunkler (yes, you heard it right. They even make a joke of it), who is Carla’s mother and is played by actress Susan Sarandon. Known for her roles in Thelma & Louise, The Lovely Bones, and The Rocky Horror Picture Show, Sarandon gets the character down pat (i.e. a wayward and wandering woman who has a gambling addiction), who is the close resemblance Hahn’s Carla in terms of the mother / daughter character similarities. Thus, it was fun to see both Hahn and Sarandon interact together on-screen. However, of the three grandmothers, Sarandon’s Isis is probably the weakest one, which is mostly due to her character smaller screen time (in comparison to Baranski’s Ruth and Hines’s Sandy) and how her character is written into the movie. Beyond these new “mom” (the Bad Mom’s moms or the grandmothers, the other new character for this movie is Ty Swindel, a kind-hearted male stripper who Carla takes a shine to, who is played by actor Justin Hartley. Known for his TV roles in The Young and the Restless, This Is Us, and Smallville, Hartley seems to having fun as a male stripper (definitely looks the part) and the exchanges he has with Hahn’s Carla are hilarious. Lastly, before I forget, actor Peter Gallagher (American Beauty and O.C.) has a minor supporting role as Hank Mitchell, Amy’s dad / Ruth’s husband in the movie. The rest of the supporting cast members are veterans from the first Bad Moms that return to their post in reprising their respective characters. This includes Amy’s two children Dylan and Jane, who are played by young actors Emjay Anthony (Krampus and Chef) and Oona Laurence (Southpaw and 2016’s Pete’s Dragon), actor Jay Hernandez (Suicide Squad and Crazy / Beautiful) as Amy’s recent boyfriend (or husband?) Jessie Harkness, actor Lyle Brocato (The Big Short and Common Law) as Kiki’s husband Kent, actor Cade Mansfield Cooksey (The Devon Taylor Show and Free State of Jones) as Carla’s son Jaxon, and comedian actress Wanda Sykes (Wanda at Large and Over the Hedge) as Dr. Karl. These characters have their moments here and there in this sequel, but, for the most part, the characters are diminished in comparison to the first movie. Don’t get me wrong, all of these actors and actresses are good in their roles, but their screen-time is limited this go-around and their characters are mostly there to fill in the background and to only have small parts. The cast of Bad Moms returns for another crazy Christmas-themed comedy with the film A Bad Moms Christmas. Directors Scott Moore and Jon Lucas newest movie reunites the main principal cast from the first one for a raunchy holiday comedy sequel that does bring the laughs as well as the Christmas yuletide spirit. While it doesn’t overtake the original movie and has a lot of similar narrative beats, this sequel does find some good hearty laughs along the way, thanks to the film’s raunch-filled comedy nuances, thematically motherly sentiment, , Christmas themed premise, and its wonderful cast. Personally, I liked this movie. Yes, it was kind of the same as the last movie and didn’t surpass the original film, but it was still a solid and entertaining comedy sequel. So, I would definitely recommend this movie, especially if you were a fan of the first Bad Moms movie. Will there be a third Bad Moms film? Who knows, but I do hope so (one with the Bad Mom’s grandmothers would be funny). Regardless if another sequel materializes or not, A Bad Moms Christmas proves that this newest installment as some staying power left in this universe of raunchy humor, f-bombs, some heartfelt moments, and yes…. Bad Moms! In short, tis the Christmas season for some laughs and A Bad Moms Christmas delivers!